After a barrage of bad publicity over recent months, regarding customer rapes, serious sexual assaults and even murders by Uber Drivers, on top of accounts being hacked and customers tracked (even after deleting the app), with Apple threatening to evict Uber from the App Store- Uber has now hit back- with fake news. They say you couldn't make this up! Well, it appears Uber have. 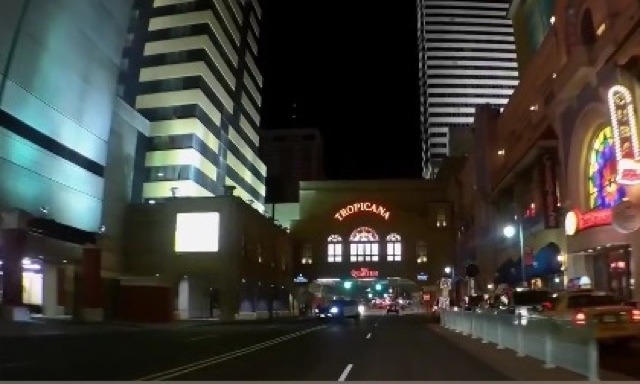 Hundreds of Uber drivers in South Jersey are suing the Atlantic City Yellow Cab Co., alleging taxi drivers have been fraudulently posing as drivers working for the rideshare serviceto steal their customers. United Drivers South Jersey -- a rideshare drivers group that serves South Jersey, Atlantic City and Philadelphia areas -- filed a class-action lawsuit Tuesday in Atlantic County Superior Court on behalf of 240 Uber drivers, according to a statement issued by the group. The Uber drivers allege that taxicab drivers in Atlantic City have been depriving "authorized Uber drivers of customers and fares that they otherwise would have received," said United Drivers South Jersey on its Facebook page. The owner of Atlantic City Yellow Cab Co., Murray Rosenberg, called the lawsuit "outrageous," and flat out denied the allegations. "There's no validity whatsoever," he said. In a post last month, the United Drivers group said customers' trust was being broken by "lying, greedy cabdrivers trying to scam them and the whole Uber system in general." The group has also posted videos that it claims shows taxicab drivers posing as Uber drivers and stealing their customers. The lawsuit, according to United Drivers South Jersey, includes claims under the New Jersey's Racketeer Influenced and Corrupt Organizations Act, or RICO, which is a state law to combat racketeering in commerce. The group also alleges that taxicab drivers are "putting riders at risk" because posing as Uber drivers invalidates their insurance. Earlier this year, Gov. Christie signed a law to license and regulate ridesharing companies after years of that industry's own controversy and regulatory battles with the state. "It is the hope of United Drivers that the taxicab companies will take immediate steps to stop this dangerous practice," United Drivers South Jersey said on its Facebook page. 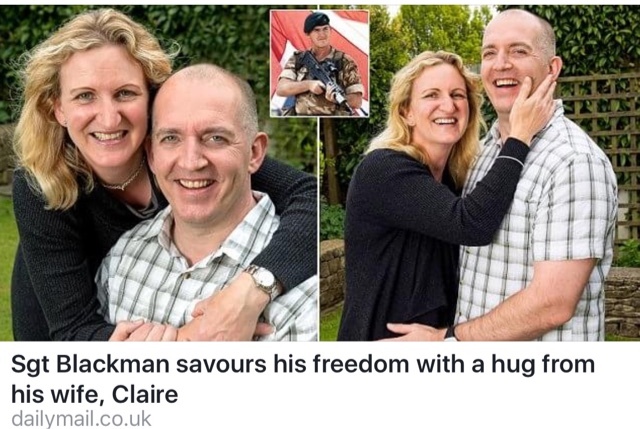 'She has saved me': Sgt Blackman tells how the love of his campaigning 'wife in a million' Claire won his freedom as he gives his first interview since being released from prison. 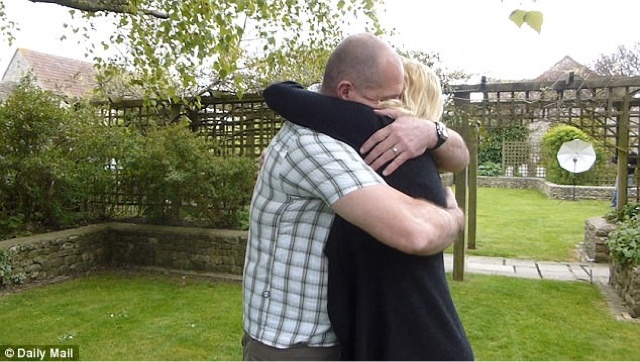 Sealed with a hug from his ‘wife in a million’, Alexander Blackman finally savoured freedom yesterday. Released from prison in the early hours of yesterday, he described waking up as a free man to the sound of ‘glorious birdsong’. It was the moment the couple have dreamed of since the commando was jailed for life in December 2013 for shooting a Taliban fighter in Afghanistan. 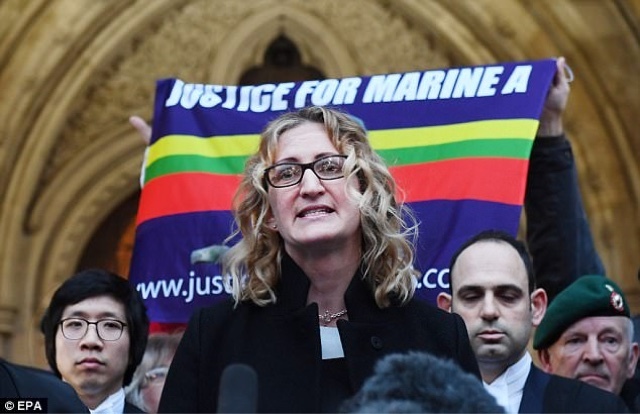 Top brass and the Establishment left him to rot in prison but Sergeant Blackman – known as Marine A at his military trial – was saved by a campaign for justice spearheaded by his loyal wife. Daily Mail readers raised £810,000 to fund a fresh legal challenge and last month he won a stunning victory at the Appeal Court which dramatically slashed his sentence. 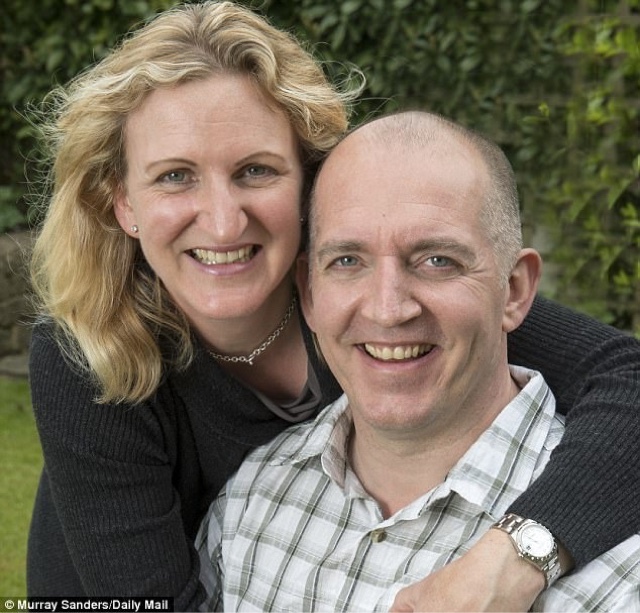 Now released on licence from HMP Erlestoke Prison in Wiltshire – half way through his revised jail term – Sergeant Blackman, 42, said: ‘I will be eternally grateful to Claire and I cannot put into words how wonderful she is. ‘She is a wife in a million. Other inmates often said how lucky I was to have her fighting so hard for me. 'I don’t think there is anybody who has witnessed the effort she has gone to who will doubt how she feels about me, and that’s beyond words really. You just can’t imagine anyone cares for you that much. Sgt Blackman added: ‘Being out of prison is an immense feeling, but I am very conscious that my sentence is not complete. I have been released on licence, and there are certain conditions which I must – and I will – respect. Careful What You Wish For, Because Sometimes... Dreams Come True. Never underestimate the collective Cab trade ability to overlook the inexplicable! Where did Gett get their pricing structure ? And what is it they are working towards ? In Uber a Law suit it was explained, no complicated maths. In one case, an Uber rider paid $54.80 to be brought from the Fairfax district in Los Angeles to LAX. But Uber used a fare of $43.55 when calculating the amount it forwarded to the driver, which came to $32.89. 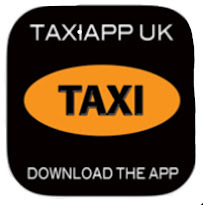 If Uber fail to get relicensed this month, there will be 30,000 PH drivers looking for an app! Gett say Taxi fares are too expensive! The hits keep coming for Uber — and not the good kind. The embattled ride-share company, already buffeted by a barrage of lawsuits and public-relations crises, is being sued again. This time, a driver is alleging that the Silicon Valley behemoth’s fare structure deliberately shortchanges drivers. In the complaint, filed in U.S. District Court in Los Angeles, attorneys for the plaintiff say they seek to have the case designated as a class-action on behalf of all Uber drivers in California. At the center of the lawsuit is Uber’s use of upfront pricing. Introduced in major markets last year, the feature provides passengers with the cost of their ride before they summon a car. Uber pitched the fare model as a way to increase transparency and address anger over unexpected rate surges when demand for rides spiked. “There’s no complicated math and no surprises: Passengers can just sit back and enjoy the ride,” the company said in a press statement. The lawsuit claims that the discrepancy between the two prices violates the terms of an agreement Uber drivers must sign, specifying that they will receive the amount charged to passengers minus a percentage the company keeps. In California, Uber generally takes 25%. To bolster their claims, attorneys Bobby Saadian and Daniel Miller — representing driver Sophano Van — allowed The Times to review photos of receipts that drivers and passengers received from three rides. In one, a rider paid $54.80 to be brought from the Fairfax district in Los Angeles to LAX. But Uber used a fare of $43.55 when calculating the amount it forwarded to the driver, which came to $32.89. A spokeswoman for Uber declined to comment on the lawsuit. She acknowledged that the calculations used to determine what passengers are charged and what drivers are paid can differ. Uber’s software algorithms calculate the fare charged to riders based primarily on the distance of the trip and an estimated time it will take, as well as factors such as how many drivers are in the area at the time, the company said when it unveiled upfront pricing. But Uber's programs can overestimate or underestimate the distance or duration of a ride, leading to passenger fares that are out of line with the reality, according to the company. The lawsuit is only the latest legal trouble for the company. For years, Uber has been fighting class-action lawsuits that seek to redefine the employment status of drivers in California and elsewhere from independent contractors to full-fledged employees. A ruling against the company would upend a crucial underpinning of its business model, as it would have to pay drivers benefits and reimburse them for gas and other expenses. A $100-million settlement proposed by the company was rejected last year by a federal judge in San Francisco as insufficient. And Uber has been in damage-control mode over a sexual harassment allegation from a former employee that led users to drop the service’s app from their phones. Google also has sued over alleged theft of trade secrets, and Uber’s senior vice president of engineering recently resigned for not disclosing another sexual harassment accusation. It is a typical Saturday night in Liverpool city centre , the streets are alive with groups of people partying the night away and having a good time. 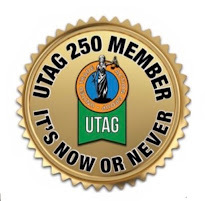 Not me though, as I have been invited out by the Taxi Alliance of Liverpool - the city’s association of black or hackney cabs - to see some of the issues they say are facing as they try to ply their trade. Jimmy Bradley is the association’s leader and has been driving a cab for decades, he arranged to pick me up near my home in Aigburth at 11pm to begin our tour. At the start of the night, Jimmy tells me that black cab drivers are facing numerous difficulties due to the huge influx and subsequent actions of private hire drivers operating in the city centre - particularly at weekends. The ECHO has previously reported how private hire drivers are flooding into the city with licenses from elsewhere and picking up fares - an issue which has led Mayor Joe Anderson to call for a city region-wide crackdown on the issue and a new universal license for all drivers. As we are in Aigburth, Jimmy first takes me down the popular suburban night spot Lark Lane and we get a first glimpse of an issue we will see throughout our trip. Along a clearly marked taxi rank, which should only be reserved for black cabs, there is a mix of privately owned cars and private hire vehicles. Jimmy explained: “As you can see there are plenty of privately owned cars on the rank, but the bigger problem is when its a private hire vehicle. He is right of course, private hire vehicle drivers are only allowed to pick people up who have pre-booked. If a private hire driver plies for trade on the street, then both the driver and passengers are uninsured in the event of an accident. Jimmy says there are just 400 taxi rank spaces across the city and with more than 1400 black cabs on the roads it is already a squeeze - so you can see why the Lark Lane scene is frustrating. Next we head towards the city centre and to Seel Street - one of the busiest night spots in Liverpool. Jimmy informs me that a large swathe of the street actually becomes a black cab rank after 10pm. I had no idea - and you wouldn’t - because there is not one single space for a hackney to pull into, with privately owned cars and private hire vehicles taking up all of the room. Jimmy is at pains to tell me that his main issue is the safety implications of private hire vehicles plying for trade with no insurance and if they have come from outside the city, no checks on who they are. He said: “The problem is that these guys can pull up outside a nightclub and take someone home to Kensington or wherever without anyone checking their background. Jimmy is not impressed with the efforts of the council in attempting to tackle the issue and throughout the nearly two hours I spent with him I did not see a single officer compared with the scores of offences we witnessed. But some action is being taken, the council said its nine enforcement officers issued 250 fixed penalty notices for private hires parked on hackney ranks between January and March. The problem is the sheer volume of private hire cars coming in - it is uncontrollable as things stand. I am intrigued about Jimmy’s claims of how many private hire vehicles are breaking the law by plying for random trade off the street instead of waiting for pre-arranged bookings. We head to the corner of Bold Street and Newington Street - which he says is a ‘private hire hotspot’. One driver is parked illegally on a yellow line and is looking hopefully out of the window. I decide to try out Jimmy’s theory and knock on the window and ask how much it would be to take me back to Aigburth. He tells me it will only be £7-£10, no problem and I am about to hop in before I say I have to ‘check with my mates’. 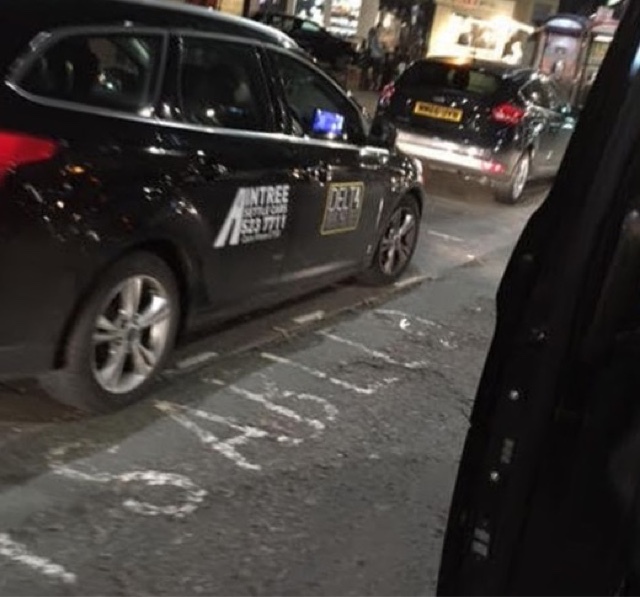 This is a clear indication of the willingness of private hire drivers to illegally pick up trade at random and it is something we see countless examples of all night. The frustration amongst Liverpool’s black cab fraternity is at breaking point. Jimmy says things have got to such a point that more and more drivers are taking matters into their own hands to let private hire drivers know they are breaking the law. 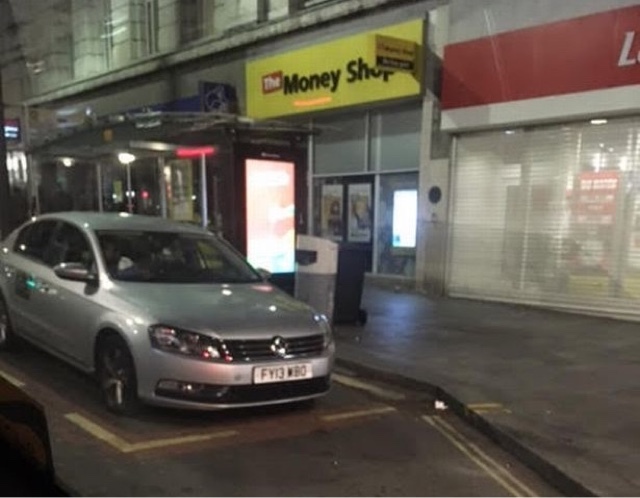 And he shows me an example of this when we catch a private hire driver clearly parked up in a taxi rank in Hanover Street. A quick word from Jimmy and the driver is off - clearly aware he shouldn’t be there - but as Jimmy says, he shouldn’t have to be doing this. As you can see from our pictures, we came across countless examples of private hire drivers parked illegally, potentially waiting for trade. And the black cab ranks are not the worst of it - we saw private hires parked at bus stops, in disabled bays and even just on the pavement. While you can sympathise with the struggles the council faces in terms of drivers flooding into the city - we really got the impression that the city centre is a free-for-all and of course this poses major risks in terms of the safety of the public. So what are the council doing? As we have pointed out, 250 fixed penalty notices in the first three months of the year is no small feat for just nine enforcement officers - but it’s nowhere near enough. The council also prosecuted 11 private hire drivers in March for a variety of offences including illegally plying for trade. That is because at the moment drivers can get licensed anywhere and head into the city centre and make a good living. The council’s chair of licensing, Cllr Christine Banks has thanked the ECHO for raising the private hire issue and has explained what work is being done to deal with it. She said: “I very much welcome the Echo highlighting this issue and we will use the evidence gathered to identify and take action against those who are breaking the law. 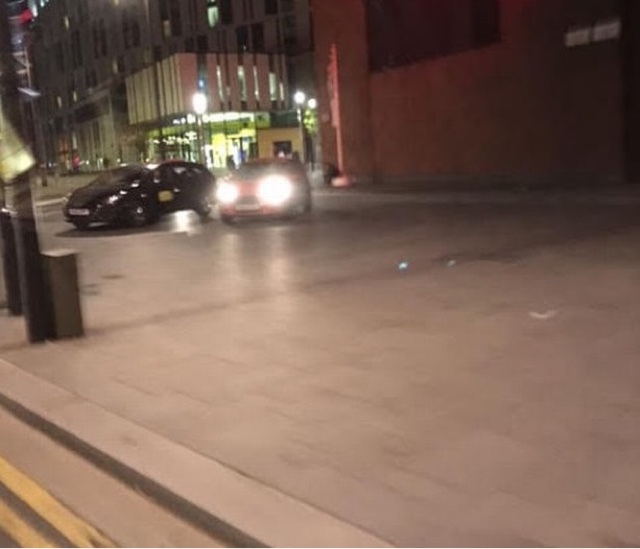 “Most of the 2,163 private hire drivers in our city do obey the law, but we have a specific issue in Liverpool with drivers coming in from neighbouring boroughs to ply for trade illegally because of our vibrant night time economy. 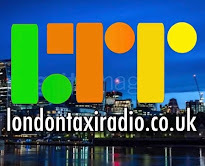 “We already run regular operations and issue fines, warnings and prosecutions to hundreds of drivers every year but could do more if we were able to use some of the taxi licensing fees paid to other areas to boost it. 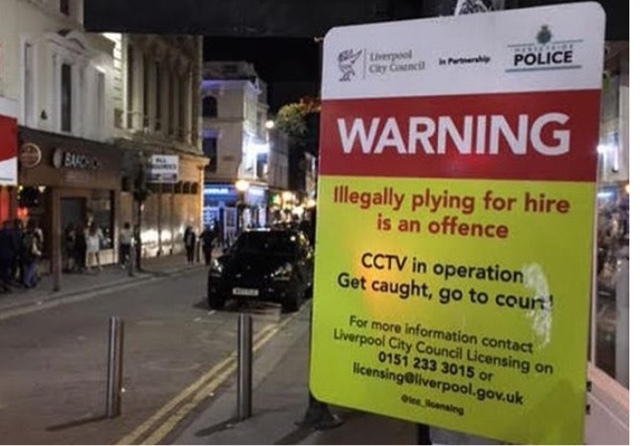 “That is why the Combined Authority is looking at introducing a city-region wide licence covering all six boroughs so we can target hot spots. 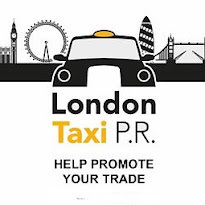 “We also need the public’s help in only using properly licensed taxis or pre-book private hire vehicles. And this is something Liverpool’s Liberal Democrat leader Cllr Richard Kemp - who joined me on our taxi tour agrees with. He said: “We need a major public information activity. I have seen people tonight getting into cars that were clearly not licensed to take them and therefore uninsured. Over the last few days, drivers have been receiving emails and letters from their MP, in reply to the pointcab.co.uk system, and we've noticed a worrying trend from the Conservative MPs. It seems the conservative MPs are under the impression that all Boris's recommendations to make the private hire industry safer, have been implemented. It also appears most of the Tory replies contain similar breakdown of supposed events.
. A formal English language requirement for drivers.
. Private hire operators to ensure that customers can speak to someone in the event of a problem with their journey.
. Even more robust 'hire and reward' insurance requirements. 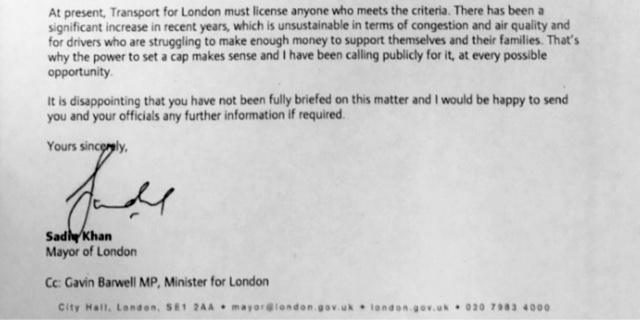 On your specific point on capping the number of private hire vehicles in London, then London Mayor Boris Johnson asked TfL to investigate the impact and feasibility of removing the Congestion Charge exemption for private hire vehicles in central London to tackle pollution and reduce congestion.
. Even more robust 'hire and reward' insurance requirements and improved record keeping and real-time provision of driver and vehicle information to TfL to make enforcement even easier and more effective. I hope these changes will have a positive impact for black cab drivers. Also almost identical reply from David Burrowes MP. Do these Tory MPs seriously not know that Boris's recommendations were not implemented or have been seriously watered down. Not only that, we now have another Tory minister who has told lies to the Taxi trade. Christopher Stephen Grayling PC is a British Conservative Party politician and former author who has been the Secretary of State for Transport since July 2016. He recently stated in answer to a parliamentary question (72004) that at no time had Mayor Sadiq Khan asked for a cap on private hire vehicles in London. Letter From Mayor Khan To Chris Grayling. 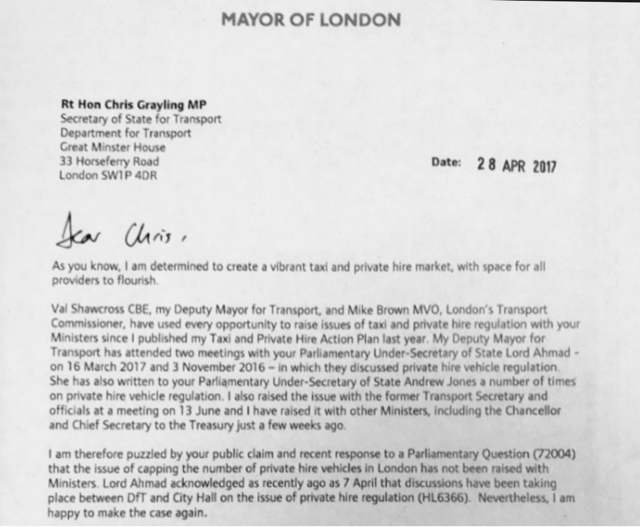 The LTDA posted this image on Twitter earlier today, of a letter from Sadiq Khan to Chris Grayling which stops short of accusing the MP of misleading parliament by saying he (Khan) is disappointed that the MP hasn't been fully updated on the matter and offered to sent the MP and his officials any further information if required. 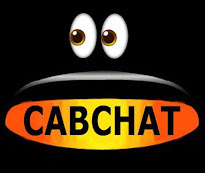 Going by the growing trend, seen within the Conservative MPs replies to Pointcab.co.uk, it appears most of the Tory party haven't been fully updated on this matter. But then Chris Grayling, prefers to keep people in the dark. In a chilling move, debated for less than an hour, the House of Commons decided the public have no right to know if their MP is arrested. 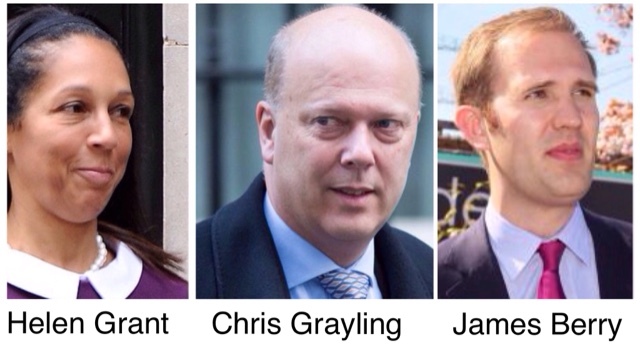 The motion was tabled when Grayling was Tory Leader of the House, arguing the naming of MPs under arrest breached their "right to privacy" under the Human Rights Act. And yet while he was Justice Secretary, Mr Grayling led Government plans to scrap the Human Rights Act. But the best emails I saw this week was the reply to James Berry MP. Thank you for your e-mail response to my correspondence regarding allegations in the Daily Mail about former Prime Minister David Cameron, former Chancellor George Osborne and Uber and I thank you for writing to the Cabinet Office to ask that the sequence of events be properly investigated so that the record can be set straight and any further investigations taken forward. I can fully appreciate that you have to balance your thoughts when it comes to your constituents’ problems and those on a national level. As an elected Member of Parliament you are the custodian of the parliamentary legislation that has been handed down to the various government bodies and their civil servant employees who should make sure that in this case the Private Hire Vehicles (London) Act 1998 (PHV(L)A 1998) is enforced. 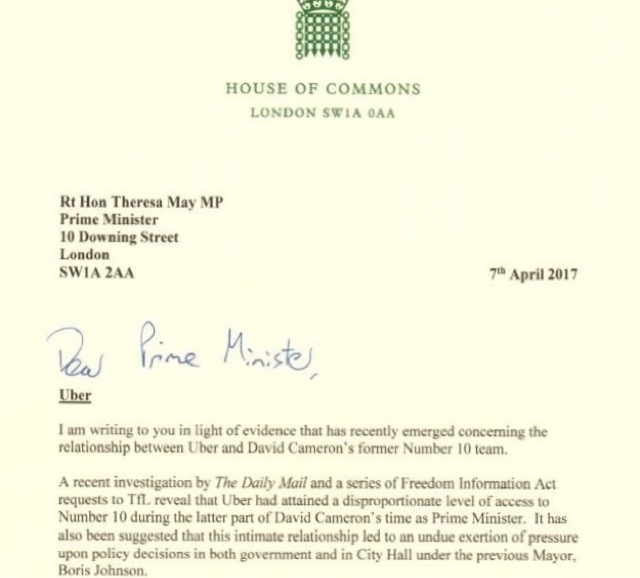 It appears that the Prime Minister and Chancellor of the Exchequer along with some civil servants have been asked for favours from family friends regarding the Uber Platform. 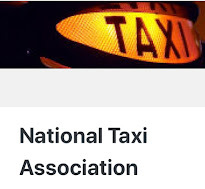 All that the national taxi trade is asking is for a public inquire as to if this is true or not, which would settle the matter once and for all. Uber has stated in a court of law that they are not a transport provider, so one has to ask why were they given a private hire operator’s licence in the first place? The (PHV(L)A 1998) states that the booking has to be made through a registered private hire operating centre where the records must be kept for inspection should the need be. The private hire driver cannot accept a booking in their vehicle even if they have a private hire operator’s licence. Therefore, Uber and its driver/partners are acting illegally as the customer is directed straight thorough to the driver, bypassing the registered private hire operating centre as required. 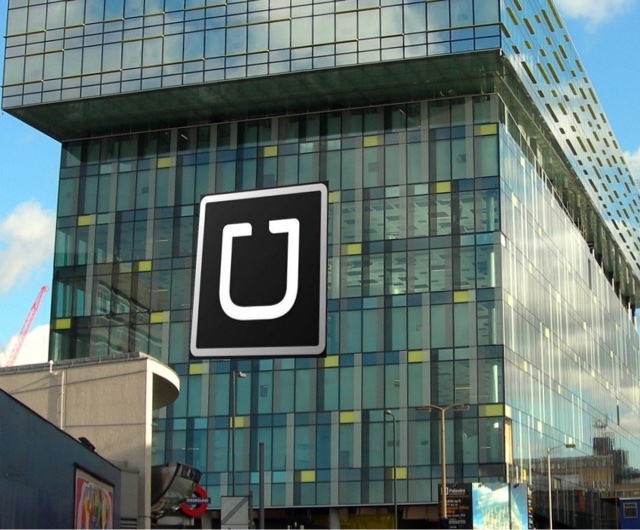 In the last 5 years that Uber has been registered in London as a private hire operator, how many times has the registered private hire operating centre in London been visited and the records inspected, as it appears that their registered private hire operating centre is an empty shell void of any communication equipment or booking records. It’s all well and good Transport for London (TfL) Board approving the proposals to modernise private hire regulations, and to raise standards in the industry in London, which came into effect in June 2016, but unless this and the (PHV(L)A 1998) legislation is enforced and the private hire industry complies then there will be no change as Uber and its driver/partners will carry on circumnavigating the parliamentary legislation that is there to protect the British public and its taxi and private hire business model. Uber may have an effect on reducing the employment figures, but what it is actually doing in reality is massively increasing the benefits budget at the same time. I look forward to receiving from you the response from the Cabinet Office. Now look at this letter Sen to Theresa May on behalf of Neil Coyle's constituency. This is probably what every Taxi driver was expecting and the fact that Neil Coyle is a Labour MP..... Speaks volumes. Government MOT plan to make cars unsafe? The government is proposing that newly purchased vehicles have their first MOT when they are four years old (rather than three, as per the current requirement). This information is from the SMMT. They report that the proposal has caused widespread concern from UK motorists who fear that it could lead to unsafe cars being allowed on the roads. The government argues that extending the wait for MOTs could save an average of £45 over the course of a vehicle’s lifetime. That works out at a saving of £100 million per year for the UK’s motorists. Of course, the counter-argument is that it will cost the car servicing industry to lose the same amount. In order to put the proposal into action, a public consultation will occur. If successful, it could lead to the new measures being in place as early as 2018. It seems, however, that the majority of motorists oppose the proposal. YouGov has conducted a survey on the matter, which indicates that 83% of drivers would rather have peace of mind over the safety of their vehicle than an extra £45. 76% of a similar data set back calls from the automotive industry to keep the law as it stands (currently a three-year wait between the purchase of a new vehicle and its first MOT). What risk does this bring to road safety? 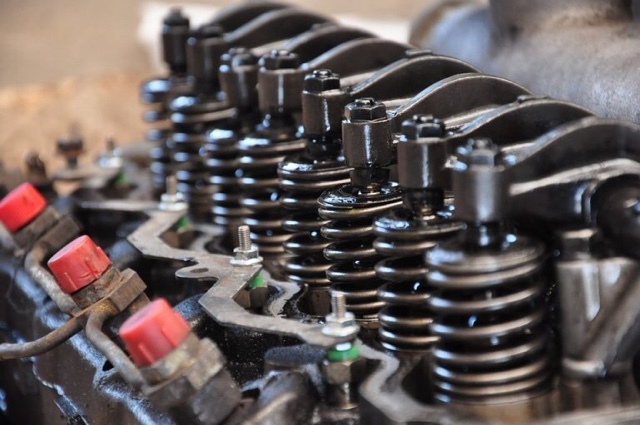 During an MOT, a mechanic rigorously tests the vehicle against legal requirements. This includes examining lights, seatbelts, tyres, brakes and emission levels. Motorists can receive fines of up £1,000 for driving a car without a valid MOT. Interestingly, many in the car industry actually believe that the current MOT checks are not rigorous enough. They would prefer reform in this area, rather than a new policy that they see as potentially harming the safety of motorists even more. In reality, most four year old cars should pass an MOT with flying colours. Indeed, the Department for Transport points out that improvements in manufacturing standards mean that new vehicles stay roadworthy for much longer nowadays. He was then asked by a respect trade voice if this was a fact, or just a prediction, to which he made this further reply. 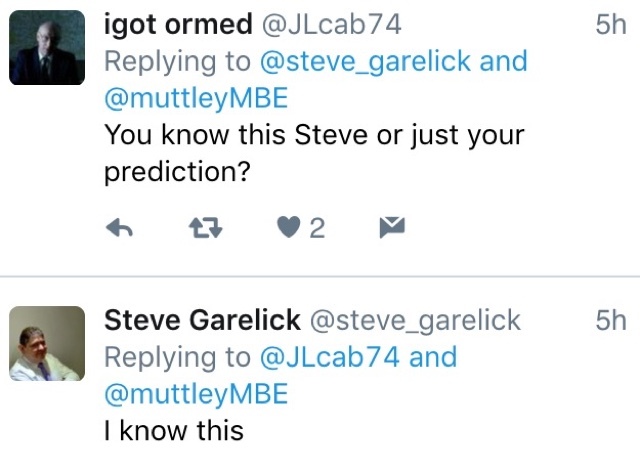 Although Steve has said that Uber will be granted a one year operators licence, this has nothing to do with the scandalous controversy, which alleges members of a previous government administration and their friends and colleagues, were implicated in putting pressure on the former Mayor of London Boris Johnson, to go easy on Uber. The one year operators licence is actually a stop gap measure by TfL while the consultation for a massive increase in licence fees take its course. If the consultation goes TfL's way, which consultations seem to have a habit of doing, then it could get very expensive to be a PHV operator in London. The largest companies (Uber included in this bracket) will have to find £1.6m plus £68 per mobile vehicle. But all this to one side, according to the GMB branch secretary, Uber's relicensing is already a done deal. Funny how our trade has to turn to a minicab Union to get this type of information ! The Good Law Project has today stated that their Uber claim has been drafted and is ready to go. The say they are currently taking advice from a specialist costs QC and will issue proceedings shortly. This is a screen shot of one of TfLs PDF's you can download. The passage is unbelievable and looks like it was written by a 9 year old child. They know the problem, but they have no solution! 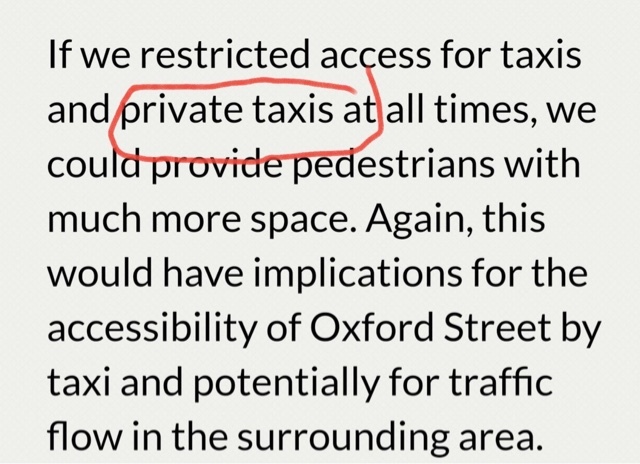 And could someone from TfLTPH please explain to me, what a private Taxi is ? As McDonald's Make Uber Announcement : Taxi Drivers And Their Families Announce Boycott Of McDonalds. 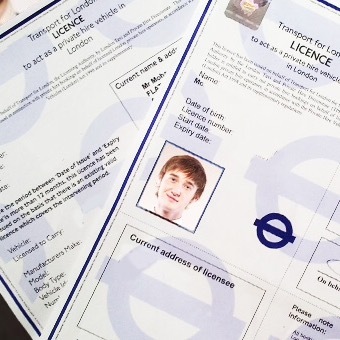 TfL CO's standard fare, big Mc and fries can now be delivered to a rank while badge and billing Taxi drivers. It's not like they need the exercise! 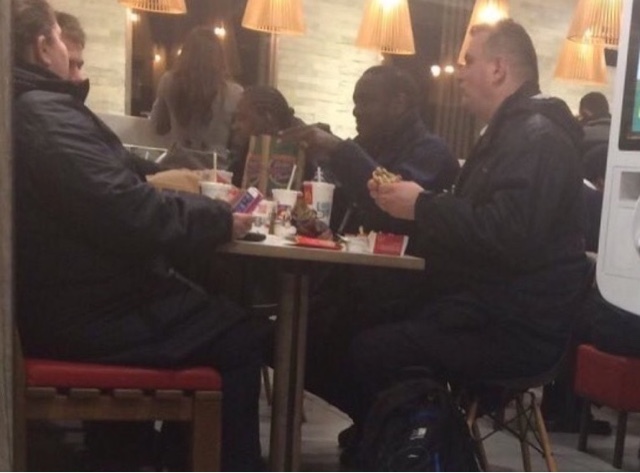 London's Taxi drivers (and their extended families) have just vowed never to walk through the Golden Arches again, after McDonalds announce they are to partner with Uber to have their food delivered. The fast-food chain is currently riding a wave of success founded on several prosperous initiatives, including all-day breakfast, aggressive soft-drink promotions, and a makeover of the Big Mac. This killer combination (possible killed more Americans than bullets) has led to exceptionally strong first-quarter sales, shooting the stock up to an all-time high. But in London, they will soon see a loss of well over 100,000 customers as cabbies boycott the store after the announcement. McDonald's plans to expand its relationship with Uber Technologies as it seeks to offer delivery of its food to customers in more U.S. cities. The Oak Brook-based burger chain, which has been testing delivery through the UberEats mobile app in about 200 restaurants in Florida since December, said today it will launch delivery in several cities by the end of June. "We're encouraged about the start we've had," CEO Steve Easterbrook said on a conference call with analysts and investors. "We are not in test mode, we are expanding." Who in the world wants McDonald's fast food delivered? It's not even that great when it's fresh. Taxi social media pages from around the world are announcing similar bans. At present, just go to any a Taxi rank in London and you will find many drivers with McD coffee cups in their drinks holders. Taxi cabs can be seen constantly day and night in the queues at drive throughs. Last night, I spoke to drivers on ranks and in a main Taxi restaurant and the drivers appear to be wholly united in their ban on big Mcs, coffees and soft drinks. 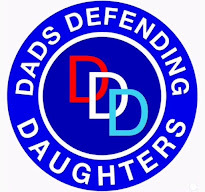 "We announced a boycott of Mansies Pie and Mash Shops and next day they announced they would drop the Ubereats contract and the same with the Bagel shop in Brick a Lane"
"Our families health can only improve by a Maccy D's ban. Now you don't even have to ge up off the sofa and make an effort to get there, they'll come to you (probably stone cold). You ever tried their fries cold ?" Set to profit from this major commercial mistake will be the company who has shown more support to the London Taxi trade than any other, Pret A Manger. Twice a year they give free coffees out to cab drivers who only have to show their badge to get the free refreshment (which is also the best coffee on the market). 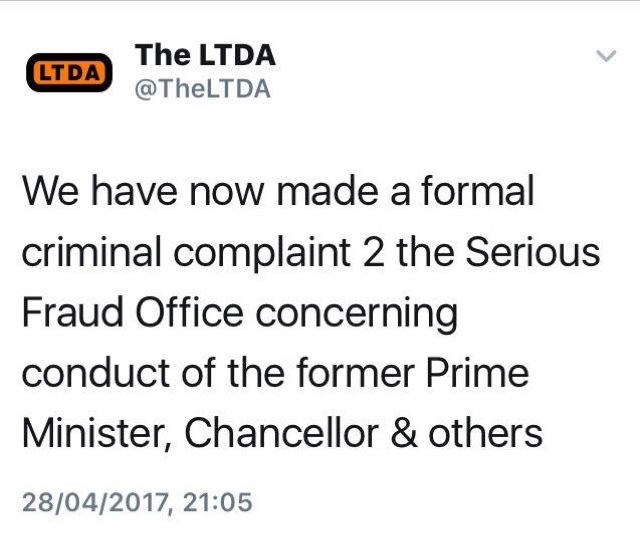 So the London Taxi trade, and going by social media many Taxi trades around the world say fair well to the ginger headed clown, as another American firm joins the circus of fools. 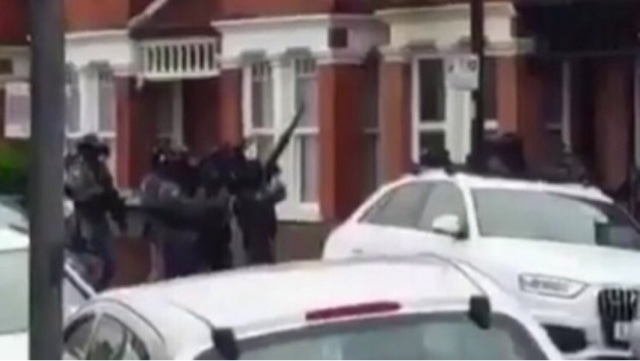 During an ongoing counter terrorism investigation this evening, Thursday, 27 April, armed officers entered an address in Harlesden Road, NW10, shortly before 1900hrs. During the operation, a female, who is one of the subjects of the investigation, was shot by police. The woman, aged in her twenties, has been taken to hospital by London Ambulance Service. Due to her condition, she has not been arrested at this time and remains under police guard at hospital. We await an update on her condition. Four people have now been arrested. The first, a 20-year-old man was arrested near to the address. A male aged 16 and woman aged 20 were arrested at the address. A 43-year-old woman was arrested in Kent a short while later. All four have been arrested on suspicion of the commission, preparation and instigation of terrorist acts under section 41 of the terrorism act 2000. They are currently in custody at a south London Police station. The address and persons connected with it had been under observation by counter terrorism officers as part of an ongoing intelligence led operation. 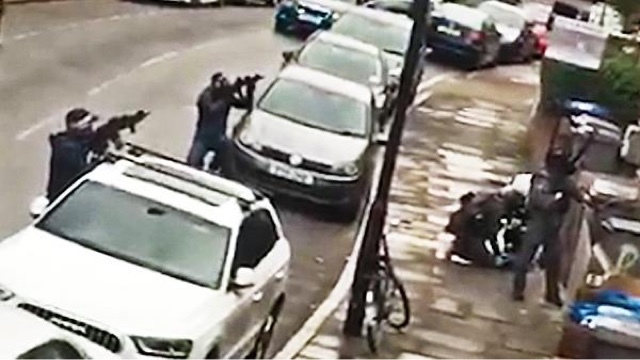 This incident is not connected to the arrest in Whitehall earlier today. In line with established post incident procedures, the incident has been referred to the Met’s Directorate of Professional Standards. This matter has also been referred to the Independent Police Complaints Commission as a matter of course. There are no other reported injuries. Enquiries continue. Searches at the address are ongoing, as well as further searches at linked addresses across London. 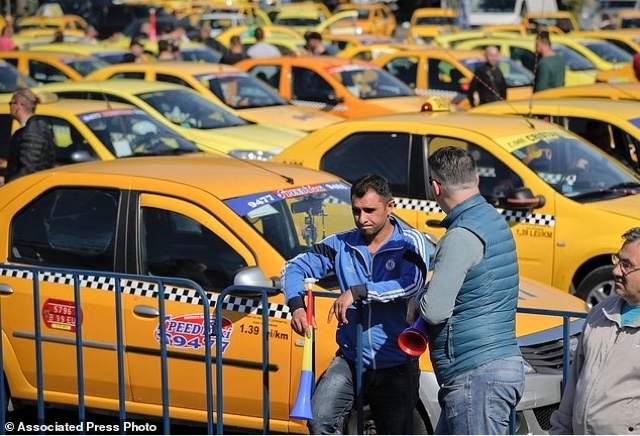 Romania: Hundreds Of Taxis And Buses Protest Against Uber. 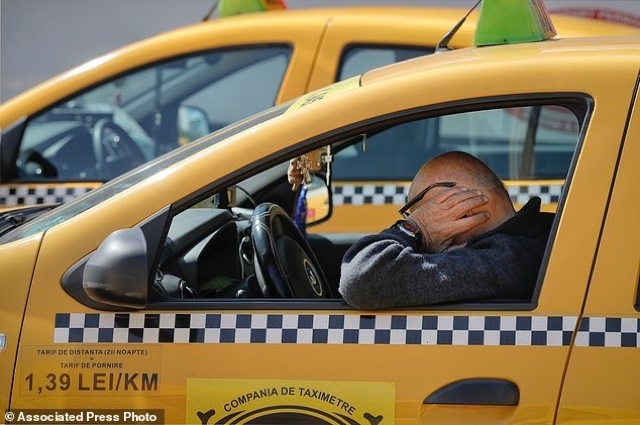 BUCHAREST, Romania (AP) - Hundreds of taxi and bus drivers protested outside Romania's government offices on Wednesday to demand that Uber and other online ride service be outlawed. 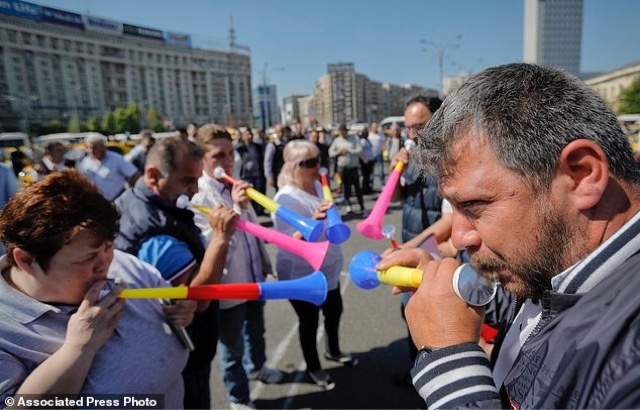 Drivers parked some 200 taxis and buses outside the office buildings in the capital, disrupting transport in the already crowded city, and blew vuvuzela horns. The protest, which had been planned to last all day, ended early after the government agreed to pass an ordinance within days better regulating taxi services. Minister for Public Consultation and Social Dialogue Gabriel Petrea met with some of the protesters and the two sides signed a protocol where the government pledged to pass the ordinance within 30 days. There were no details immediately available how Uber would be affected. The Confederation of Licensed Transport Operators says it wants "online technology platforms that provide unauthorized taxi services to be outlawed," to protect licensed carriers. 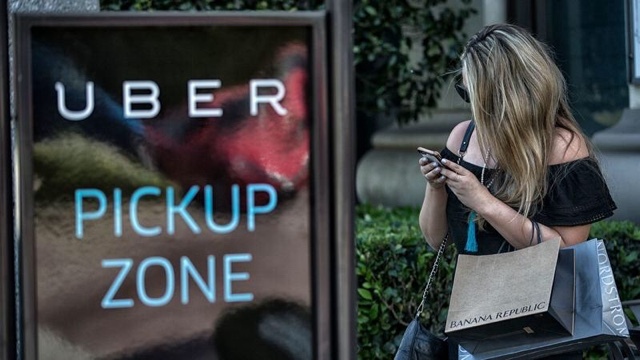 Uber says it is a ride-sharing service with transparent costs and its drivers pay taxes. It says some 250,000 clients have used its services in the Romanian capital and other major cities in the past two years. 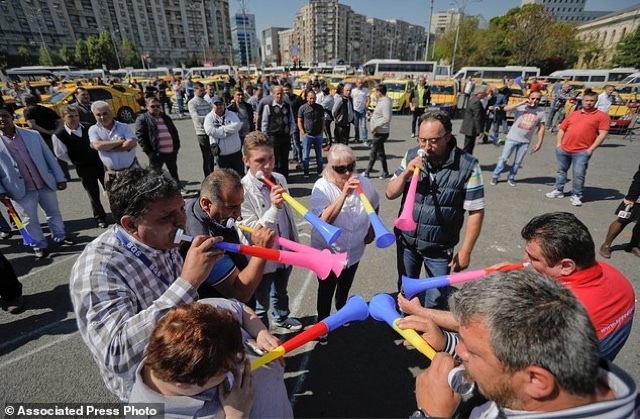 Taxi drivers blow into vuvuzelas during a protest outside the government headquarters in Bucharest, Romania, Wednesday, April 26, 2017. Some 200 taxis and buses have parked outside the government offices in Romania's capital, Bucharest, demanding that Uber and other online taxi services be outlawed in the country.